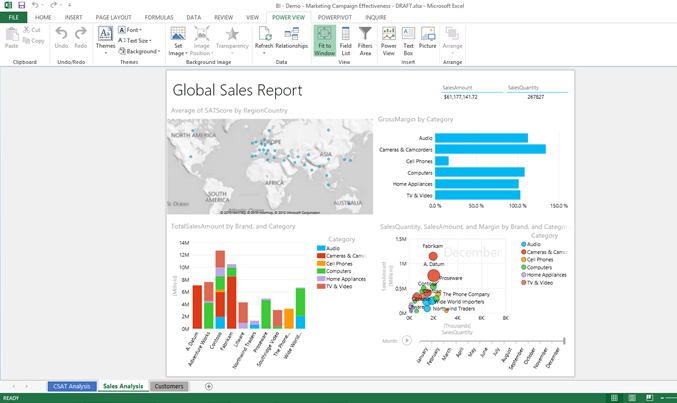 Yesterday Microsoft announced Power BI for Office 365: a self-service Business Intelligence solution delivered through Excel and Office 365. 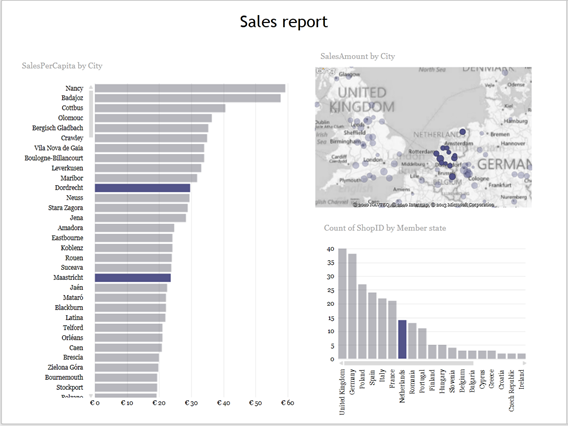 Power BI ties together the various bits and pieces we already had (Power View, PowerPivot, GeoFlow, Data Explorer) and also introduces some exciting new functionality. In this post I will introduce you to Power BI and discuss the various capabilities. Future blog posts will deal with the components more in-depth. 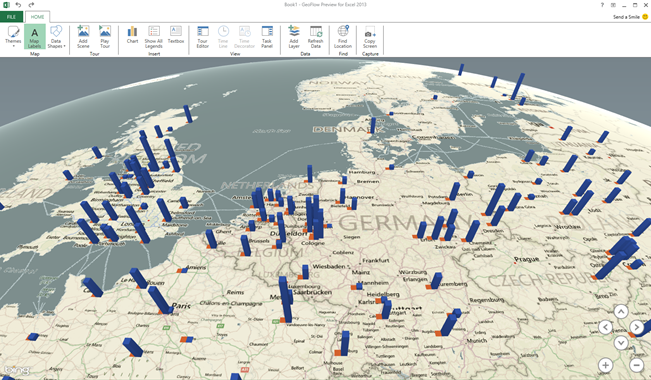 (By the way, do not let the tag “for Office 365” set you back; Geoflow Power Map and Data Explorer Power Query are available as add-in for Excel regardless of whether you use Office 365 or not). The image below shows the Power BI platform. I have broken it down in two segments: Excel and Office 365. 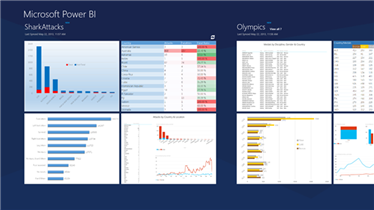 With Power BI we take the next step to making Excel a true BI tool. BI developers used to smile when I talked about Excel and told me Excel helped end users create non-transparent, spaghetti like BI solutions. I have to admit, that is true. 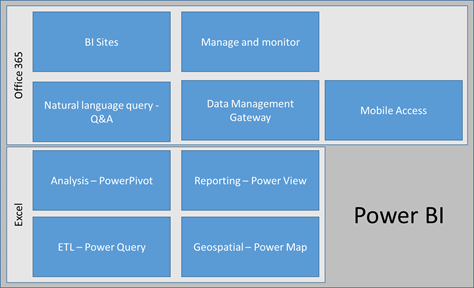 Now with Power BI anything you do with data in Excel, from loading and cleansing using Power Query, modelling and enriching it using PowerPivot and finally displaying using Power View and Power Map is structured and traced. No more page long formulas. No more copy-paste, hidden sheets, linked formulas and other nightmares for us BI folk. 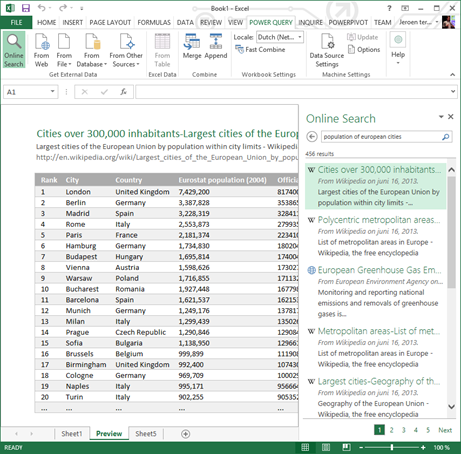 Previously named Data Explorer, Power Query is our self-service ETL tool in Excel. 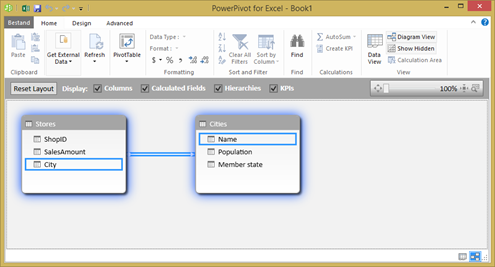 Power Query can connect to just about any data source you throw at it and it enables you to load data, cleanse it and then use it in your Power Pivot model. 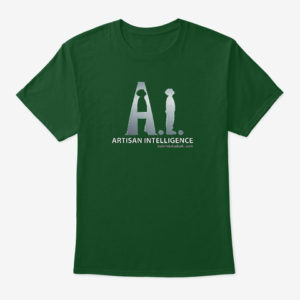 It even includes a natural language search function that helps you find information in your organization or on the web if you do not actually know where the info could be at. Imagine have loaded something from your corporate data warehouse and then adding relevant external information (such as weather or population info) from the web without having to leave Excel! Once you have loaded data you can add and drop columns, change data types, split columns, combine tables, filter data, remove duplicates, etc. 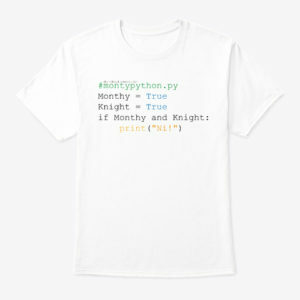 Power Query not only connects to “standard” databases and files, but also includes a connection to Facebook, Hadoop (HDFS and Azure HDInsight), SharePoint and any OData Feed. All steps you do in Power Query are stored in a script so it is clear where data came from, what happened to it along the way and where it got displayed. See my screenshot below: I did a web search for ‘population of European cities’ and clicked on a Wikipedia page to get the data in Excel. PowerPivot has been out for a while and has gotten quite some attention. PowerPivot allows you to do data modelling with massive amounts of data in Excel. With massive, I mean huge. I keep repeating this as long as I keep meeting people who still think that Excel cannot handle 5 million records (that happened to me yesterday). With PowerPivot it is easy to load data from various sources, link them together (essentially creating a data model) and apply formulas. Using PowerPivot you create a structured model for your data in Excel. And it is fast. (Did I already mention it can handle lots of data?). Now I can do interesting stuff, such as add a calculation to figure out sales per inhabitant (Sales per Capita), by adding a column to the Stores tables with the following formula: =[SalesAmount]/RELATED(Cities[Population]) . (Dividing SalesAmount by the related cities’ population). Ah yes, Power View. The tool that is so easy to use that even my mom can use it (and its true). Power View enables you to create great looking, interactive reports with just a few mouse clicks right there in Excel. Just select what you need, decide how to show it and you’re done. Power View includes all the standard things: tables, matrixes, column charts, bar charts, pie charts. It also includes some great features that introduce time as a factor in your analysis by allowing you to create scatter plots with a play axis (think bouncing bubbles). Moreover, Power View can display images right there in your report and includes 2D mapping functionality. In my example, with just a few clicks I created this report (I selected the Netherlands as country in the bottom right graph to show the highlighting capabilities in the other graphs). Also note the texts above each item to understand what is displayed here. Power Map (previously known as GeoFlow) is a very powerful 3D mapping tool. It allows you to plot any data on a map, as long as it makes sense. For example, just trying to plot your products on a map might not make sense. However, plotting your stores on a map makes a lot of sense. You do not need to specify longitude and latitude or other fancy stuff. Just some text is enough and the tool will go out and try to plot it on a map. Just try it, enter some city or venue names in Excel and click Insert à Map. Two more clicks and you have plotted the information on a map! (Above shows total sales amount and sales per capita per city, plotted on the 3D map). A BI site is an optimized workspace dedicated to BI. You might call this a data marketplace: it is a one-stop shop where you go to get anything related to BI. 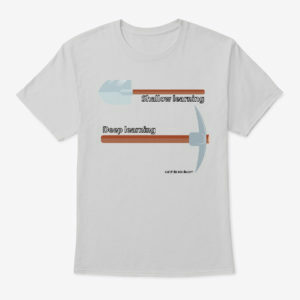 You go there to consume a report, create a new analysis, share an analysis, discover some new insights using the items provided and find information. This is a feature I particularly love! It gets us closer to Minority report: just type what you’re looking for and we’ll find it and display it. Once information is published to the BI Site (for example through the Data Management Gateway (below) but also just by uploading an Excel sheet), you can search through all that information just by typing a question. In my example this might look like ‘sum of sales amount by country’. You can change the way the information is displayed by including ‘as map’ or ‘as bar chart’ to your question. I do not have a demo available right now, so I’ll just include a screenshot here. 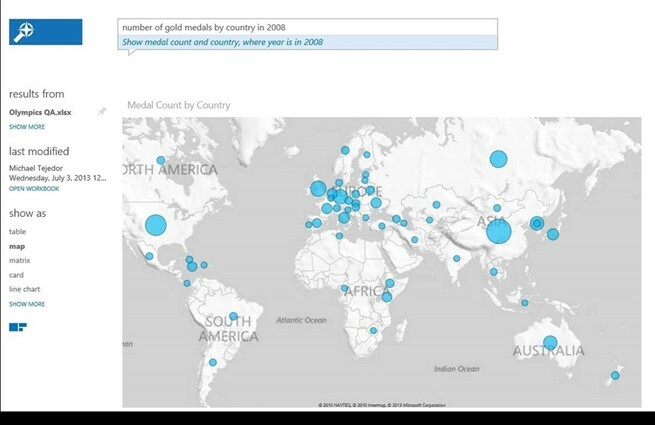 Here the user just typed ‘number of gold medals by country in 2008’ and the information is retrieved from an Excel sheet (note that the user has not explicitly asked to get data from that particular sheet) and shows it as a map (since we know this is geospatial information). Power BI empowers data stewards; business users can grant access to published data sets based and track who is accessing the data and how often. This brings to mind the PowerPivot management dashboard we know and love. The data management gateway allows IT to build connections to internal data sources (think your data warehouse or other LOB information source) so reports that are published to BI sites can get that data easily. Last but not least: mobile access (woohoo!). Users can access their reports through a HTML5 enabled browser or through a mobile application on Windows or iPad. This means that Silverlight is no longer a requirement for accessing Power View reports. Other platforms might be added later. So you have read this and maybe read some other blogs as well. You’re thinking to yourself: why should I care? My question then is: do you use Excel? Well yes, any person who has ever worked with a PC has used Excel. Exactly. That’s why you should care. You should care because the good old Excel which you though you knew so well has suddenly transformed into a cool kid on the block with lots of great and really easy to use features. Those features enable you to find any data, work your magic and then gain insight from that data. Just think about that. How could you use this in your business? And in your personal life? (I myself am looking to buy a house. Power BI has allowed me to understand which neighborhoods I would like to live and which not, just by finding and visualizing data). I know there are specialized, paid, services for that (involves sending a text and paying for the info). I did it myself in half an hour, paid zero and learned a lot more about the question at hand. This might be a revolution: Power BI brings the might of information analysis tools to anyone to consume any data for any scenario. The possibilities are endless. It is just a matter of using your creativity. Since you are human, using your creativity is probably what you really want to do. 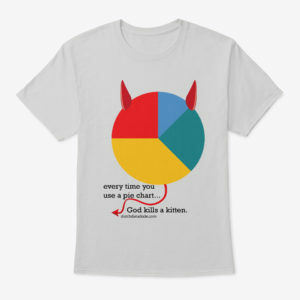 Power BI: be creative with data. 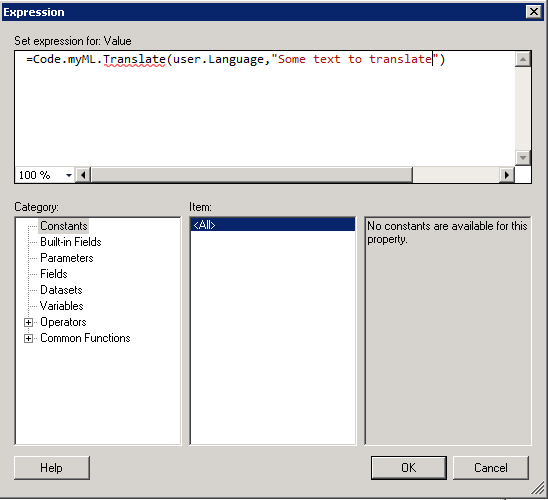 This is the second post in my series about making SSRS report multilingual. You just missed the first post, the introduction and comparison of the solution scenarios. This solution consists of an assembly registered in each report that should support multiple languages / localization. The assembly retrieves translation from a source, such as a data source, resource file, web service or online translation service. Anything is possible here. 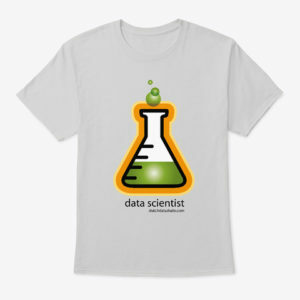 This solution is limited in the fact that it will not translate dataset results nor parameter prompts. In addition there is an impact on the report creation process as you will see down the line. The upsides are that it is a relatively straightforward solution that has only little impact on report rendering performance. To implement this solution we first need the assembly that will do the actual translation / localization. 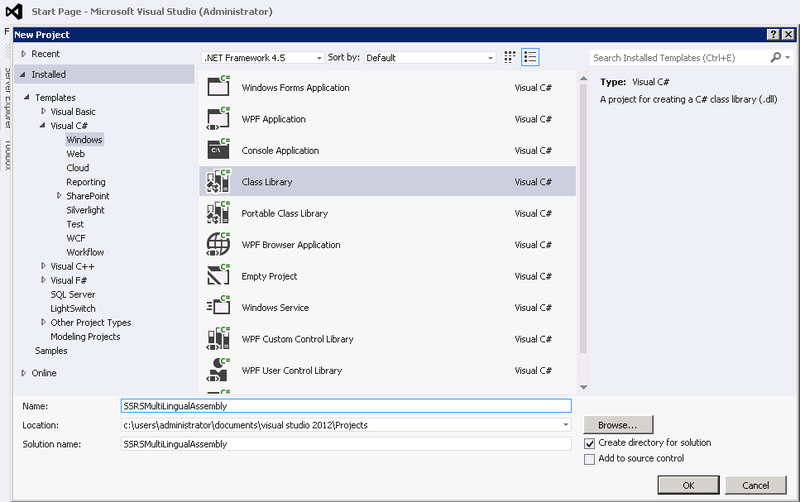 To build this assembly fire up Visual Studio and create a new Class library project. I will use C# here (and in all my samples on this blog, but another language would work just as well). I named the project SSRSMultiLingualAssembly. When the new solution and project has been created, rename Class1 to something that makes more sense. I renamed it to SSRSMultiLingual. What you would need to do is implement the class and translate the item using the cultureInfo and return the translated result. This is very dependent on your actual situation and also fairly independent on the actual scenario you choose to implement. For now, let’s continue to the SSRS side of things to tie things together. Later we can deal with actually making it do something. After you have added the code, build the solution and make sure there are no errors. To make the assembly you have just built assessable from reports, you will need to copy it over to the SSRS directories, including any resource files or whatever your assembly needs to work. Of course you could make this part of a custom build action and kind of automate this action, but for now here is the manual method. 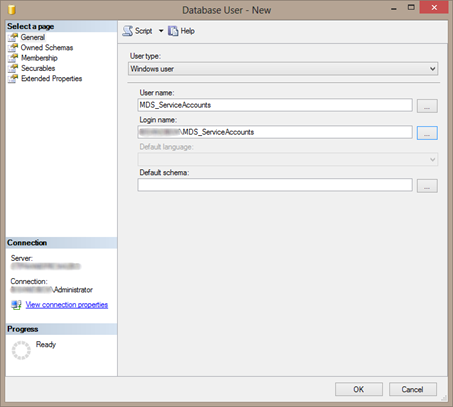 (this path may change based on installation location and version of SQL you have installed). This will register the assembly with the report server, which is strictly only required after deployment of the reports to the server and not during design / development time. In order to make it accessible during design time, the assembly also needs to be copied to the report designer folder. Copy and paste the assembly to C:\Program Files (x86)\Microsoft Visual Studio 10.0\Common7\IDE\PrivateAssemblies (again, this path may change based on installation location and version of SQL / Visual Studio you are working with). Note the (x86) in C:\Program Files (x86), since the same directory also exists in C:\Program Files if you are working on a x64 system (which I assume you are). By the way, if you use reporting services in native mode (i.e. not integrated with SharePoint) you also might have to copy the same assembly to C:\Program Files\Microsoft SQL Server\MSRS11.MSSQLSERVER\Reporting Services\ReportManager\bin. I have not tried this since I am running SSRS in SharePoint integrated mode. Note that you could also add the assembly to the global assembly cache (GAC). 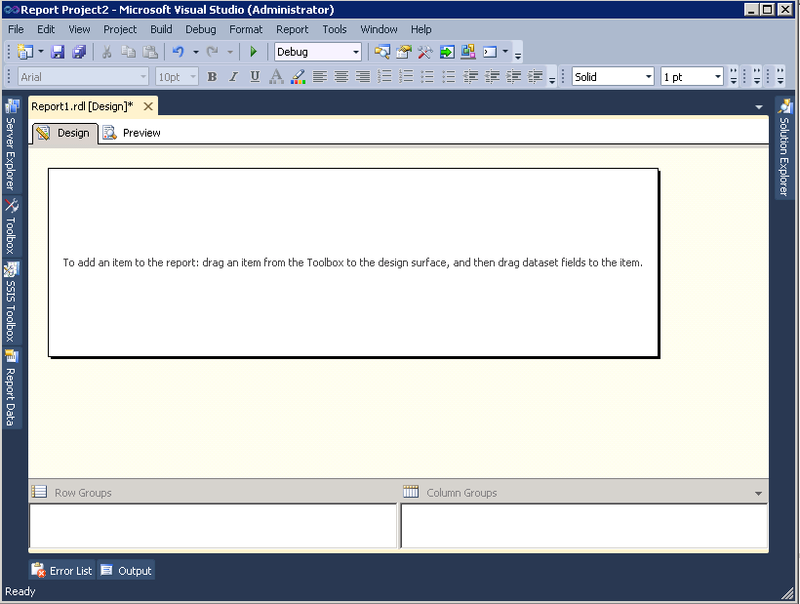 In order for your reports to successfully use the assembly to translate text open a report in Report Designer (your Visual Studio environment). From the report menu select report properties. In the dialog box click references. Click add and then click on the ellipsis button (…) at the end of the newly added row. In the next dialog box (add reference) click browse, locate the assembly and click ok.
Verify that your assembly has been added. 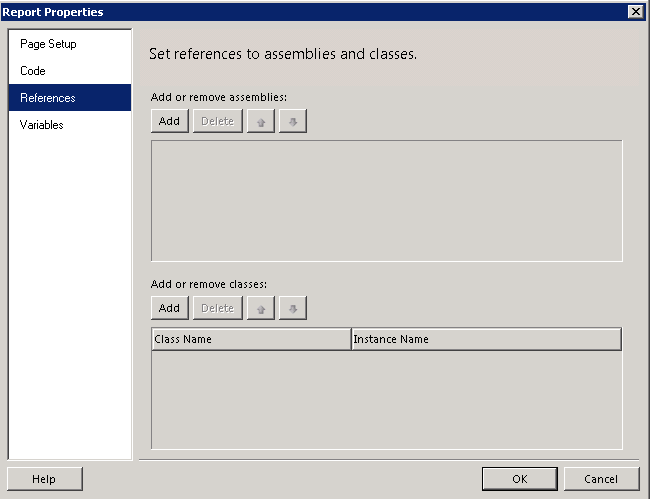 In the bottom part of the dialog enter your class name (assemblyname.classname) and set up an instance name. Note that the class name is case sensitive. Your instance name can be anything, I chose to set my instance name to ‘myML’. Now that we have added the custom assembly to the report it is time to call the translate function to translate text! Click ok to close this dialog. Never mind the red squiggly line. Now, the big moment is there! In report designer click preview and see the results of your labor! Come on, pat yourself on your back, you have successfully registered a custom assembly and used it in a report. That wasn’t too hard now was it? Note that you will have to set up this expression with the correct parameter value for every single text on the report that you want to translate. This is very laborious and error prone. Also, this is the reason why this solution does not translate parameters. Once you have completed the report and am certain it works OK it is time to deploy the report to the report server. For the assembly to work there you will need to have the assembly in the appropriate places (see above) make some configuration changes and you will have to restart your Report Server after any change in the assembly, including first registration. Change the Url value to match your situation. This code group gives the assembly (your assembly in the directory specified above (which you will have to change based on your installation) full trust permissions. 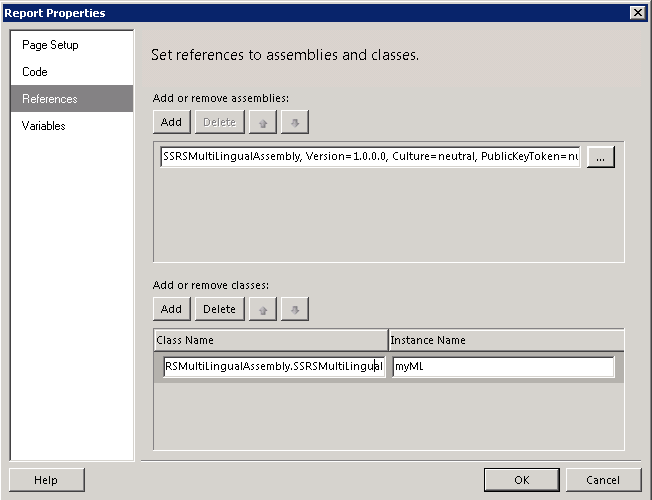 For testing purposes you could get rid of the SSRSMultiLingualAssembly.dll part and give any assembly in the directory full trust, however in production you will have to set up the code group as specific as above, so why not do it right from the start? Now it is time to restart the Reporting Services service. 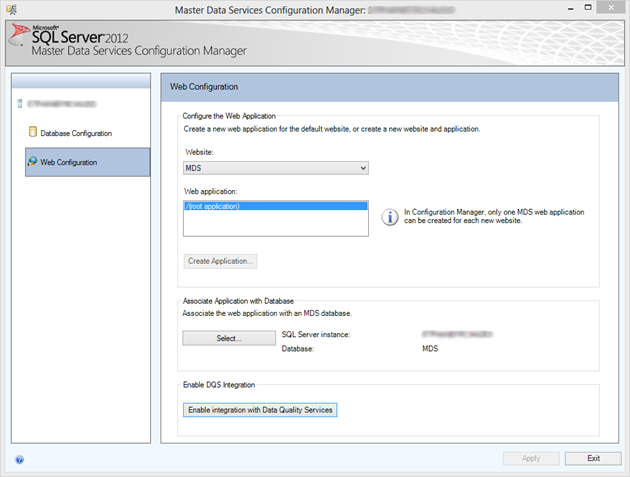 To do this either use services.msc or use SQL Configuration Manager. Now, deploy the report and render the report. You can test different languages by switching your Internet Explorer to another language (Settings à Internet Options à Languages). Rejoice! You have successfully implemented this scenario of localization of SSRS reports. It may be time to check out the other implementation scenarios. In most solutions retrieving a predefined translation would be preferable to doing an automatic translation using an external translation service, since the quality of the results can be questionable. A scenario I come across often is that the external translation service is only used when a predefined translation is not available. The scenarios discussed in this series of posts do not pose any requirement on how the translation is retrieved. Reporting Services can pass the user’s language setting along. That can then be used to get the right translation. Can the report be developed once and presented in multiple languages? All of the scenarios discussed in this series provide this capability. Impact on report creation process. Does the solution chosen require manual activities when designing the report? 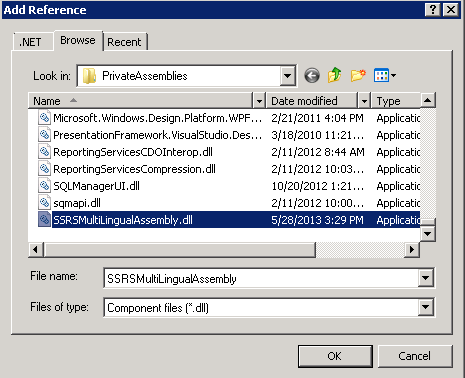 In this series of blog posts we talk about options for implementing multilingual SSRS reports. Below is a quick scoring of each option on the above capabilities and requirements. Of course the importance of requirements and the correct choice depends on the situation. Each scenario will be discussed in a post in this series. Did I miss a requirement or solution? Please let me know! Next time: Scenario 1: Assembly. June 10th, we will be hosting a SQL Server 2012 and SharePoint 2013 – better together session aimed at partners at our Microsoft office in the Netherlands! This is the third delivery, because the first two deliveries were overbooked and highly valued. Just about every new consumer technology device will be greeted with “unboxing” videos on YouTube. A lot of the people I talk to really need to start unboxing SQL Server 2012 and start to understand what is in the box. Most of them already have access to SQL Server 2012 and still think it is just a database. There is so much more! This post is aimed to providing a quick overview of what exactly is in the box with pointers to where you can find documentation. Introduced with SQL Server 2012, DQS is a knowledge-driven data quality solution that works on the premise of specifying what defines data quality in a knowledge base and using to cleanse data automatically during ETL (see SSIS below), Master Data Management (see MDS below) processes or manually. That concludes the quick unboxing of SQL Server 2012. Although there is a lot more to say (about features, but also around editions and capabilities) , this should give you a good idea of what is in the box. Bottom line: there is a lot more to SQL Server than just a database!